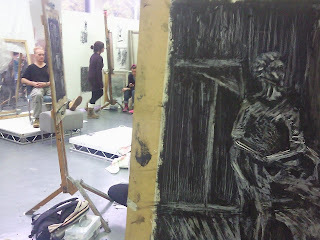 This week is a drawingweek, today we we had to create a reductive drawing using a rubber on paper which was blackened with charcoal to leave the darkest areas white (image on left). The full figure had to be drawn and be revealed by picking out highlights and mid tones with the rubber. We covered different types of drawings such as cubist (on right) and also drawings where we avoid the model and only drawthe background, these all created different effects which were highly interesting. 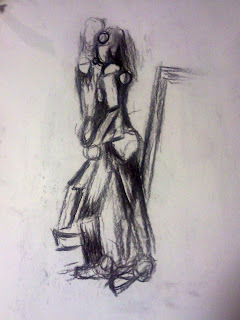 In the afternoon we continued the reductive process but used a different media and paper. The paper we used is called Satimatt paper which has a coating that prevents the paint from being absorbed. 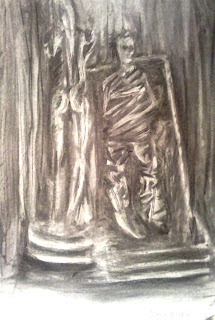 We blackened the paper using oil paint and white spirit (you can imagine the smell of 30 people using turps in a confined studio) then the reductive drawing was made by scraping the paper with rags and white spirit , I also used a plastic knife and fork which created some interesting marks when scratching away the paint. Today was helpful in developing my use of media as I had never before used oil paints and now don’t feel pressured when using them. The process was helpfull in swapping perspectives of dark and light also how doing this can result in an interesting piece of art work.